The thrill of travel and discovery never gets old. That’s why we continue to seek out new ports of call to add to our voyage offerings every year. Be one of our first passengers to explore these exciting new destinations. Uncover the hidden gems of a city and live like a local through our immersive on shore experiences. Nordic charm emanates from Denmark’s second largest city. Enjoy a unique blend of modern and traditional architecture and exceptional fine dining. Take a step back in time and explore historic medieval churches, then jump into the modern era at uniquely innovative museums. End your day of Danish discovery at one of four Michelin restaurants. 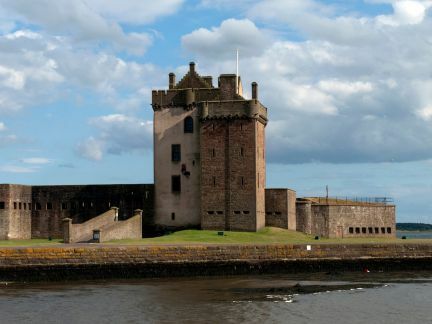 See why Dundee is referred as the City of Discoveries. A golf-lovers paradise, this is the birthplace of the game and the perfect spot to squeeze in a round. 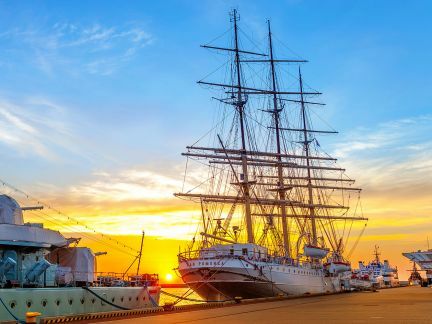 It’s also the ideal location to brush up on your naval history with a tour of the HMS Unicorn, a nearly 200-year-old ship from the golden age of sail to life. Afterward, relax by the River Tay and take in the views of Scotland’s hidden gem. 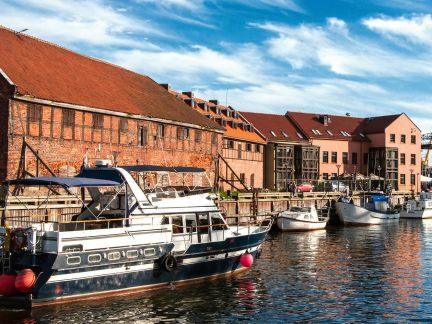 The 1,000-year-old port city of Gdańsk was mostly destroyed during WWII, but there are still many impressive sights. 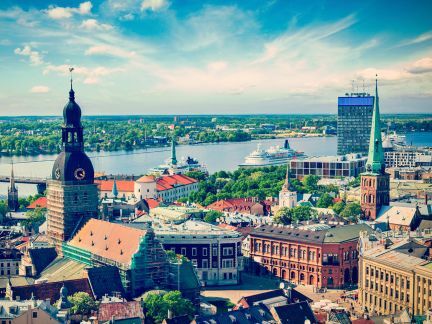 Wander through cobblestone streets and mazes of red-brick buildings to discover the Upland Gate, St. Mary’s Church, the medieval Gdańsk Crane, the Great Arsenal, and the Amber Museum and National Museum. Then relax at a beer garden and take in the beautiful coastline. Walk the cobblestoned Old Town in Klaipėda and you’ll see its German heritage in the architecture, beginning at Theatre Square where Hitler once spoke. The old warehouses by the Dane River are now pubs and restaurants; try a traditional lunch of fish stew with black bread. 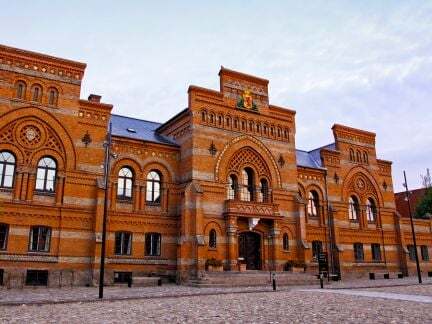 Other sites to see include Memelburg Castle, the Ethnographic Fisherman’s Farmstead, and the quaint village of Palanga. Your destination for a captivating Scottish adventure. 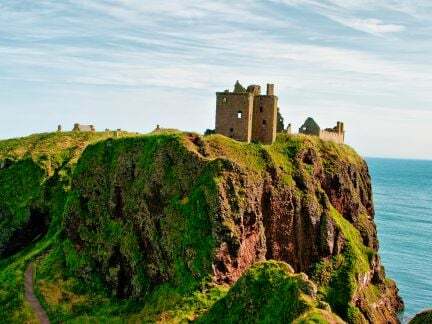 Storied castles and stunning Highland views. Cinematic landscapes and charming local culture. Get outside and explore the Scotland of your dreams in Oban by kayak, train, or dram full of whisky. 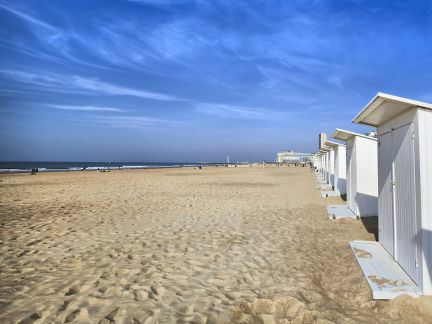 Oostende is a gem of the Belgian seaside. Relax on the city’s wide sandy beach, take a stroll along the seaside promenade or explore WWII defences at the Atlantic Wall. Later, download a walk-umentary to learn about Marvin Gaye’s interesting connection to the city as you continue to explore. Cap your evening off in the Langestraat district for a Belgian Brown, and crab claws—a local favorite! 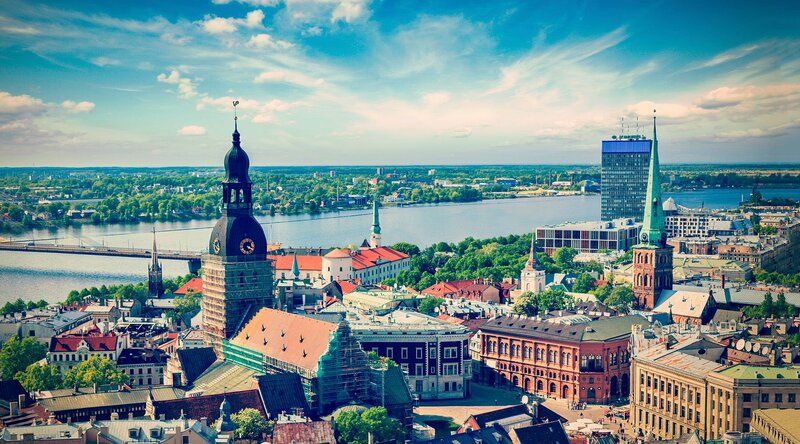 Riga’s Old Town is a UNESCO World Heritage site and its winding, wobbly lanes are beautiful to wander through. The Museum of the Occupation is fascinating, haunting in parts. The restored 18th-century National Opera House is worthy of a whole evening. The new National Library is a huge glass and steel mountain. And don’t miss an organ recital in The Dome - the organ one of the largest in Europe. Alive with history and culture. Overflowing with natural beauty. Explore iconic architecture, crashing waterfalls, and local art. This laid-back city is your gateway to adventure in the Outback and is the heart of Australia’s wine country. 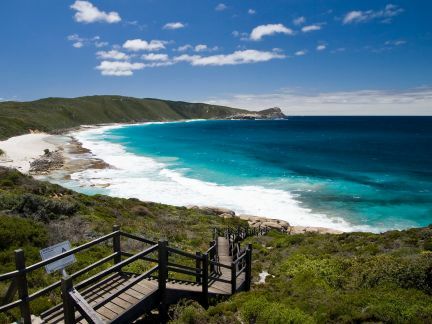 Don't miss a trip to Kangaroo Island! 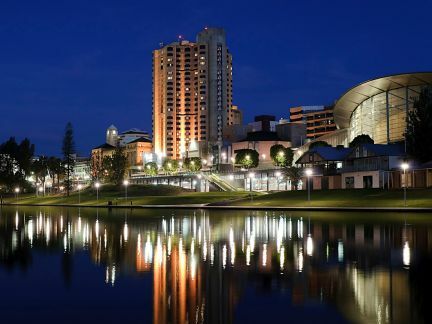 The cosmopolitan capital of Southern Australia boasts a vibrant culinary scene—the most restaurants per capita of any Australian city—and a beltway of gorgeous parkland surrounding the downtown core. Set along a rugged coastline, Albany provides a look at the colorful history of Western Australia’s settlers as well as whale watching fun. On a peninsula surrounded by the Indian Ocean, this cosmopolitan port features waterside restaurants and a bay home to friendly dolphins. The rich soil of the Margaret River makes the area a must for merlot lovers, and Wardandi Memorial Park offers unique insight to local Aboriginal culture. Beaches beckon in this western port town. 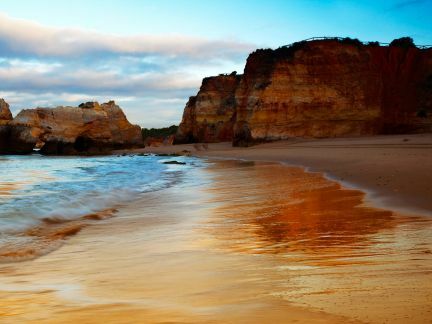 Dig your toes into Australia’s whitest sand beach and gaze out at over 100 islands in the archipelago. 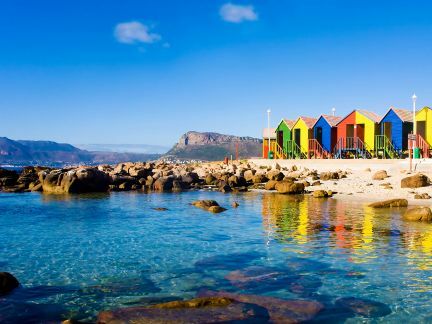 Hikers will be left stunned by the incredible views on the Cape Le Grand Coastal Trail, while animal lovers will make memories as they get up-close and personal with penguins, sea lions, dolphins, and more on Woody Island. 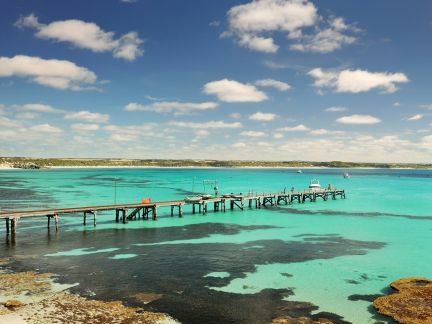 Western Australia’s Batavia Coast has miles of white sand beaches, emerald seas, and lovely small towns, one of which is Geraldton. 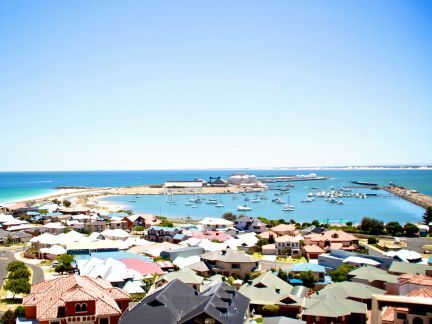 It’s blessed with sun and consistent winds, and has become Australia’s windsurfing and kite surfing capital. Take an eco-cruise of the Abrolhos Islands, visit the Western Australian Museum and Point Moore Lighthouse, and tour the Byzantine St. Francis Xavier Cathedral. 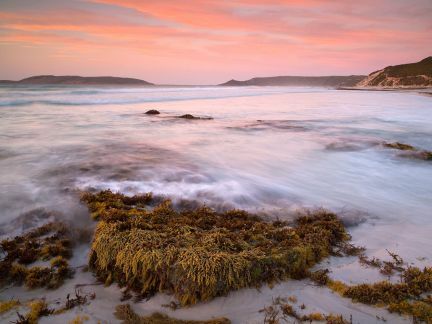 You’ll find more than just kangaroos on Kangaroo Island. There are also koalas, platypus, ring-tailed possums, birds, and 45 plant species found nowhere else on Earth. Watch penguins, pelicans, whales, and sea lions at Seal Bay Conservation Park, and see more sheep than people—at a ratio of about 136 to one. 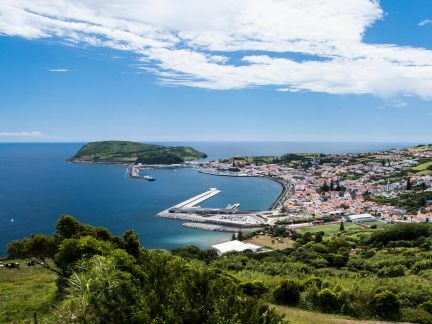 Be sure to sample the island’s famous cheeses, honey, and inspired wines. Situated beside the Swan River, Perth is a magical place to explore. Start in Kings Park on Mount Eliza for an enchanting treetop walk. To indulge in some retail therapy, visit the high-end fashion boutiques of King Street. You can’t miss the historic port of Fremantle with its prison & shipwreck galleries. And just north of Perth lies Swan Valley, Western Australia's oldest wine region. 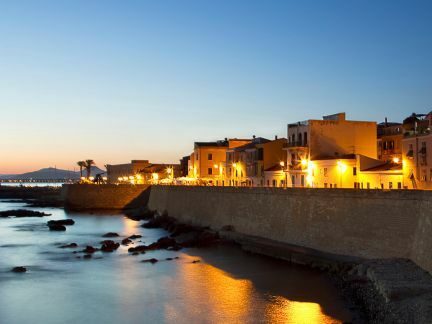 A walled medieval city with Catalan influences, Alghero has an independent spirit and is home to some of the island’s most compelling architecture. Enclosed by honey-colored sea walls, it's one of Sardinia's most treasured ports—and for good reason. From rustic trattorias, to Gothic palazzi, to winding cobbled lanes, this is one of the Mediterranean's true gems. 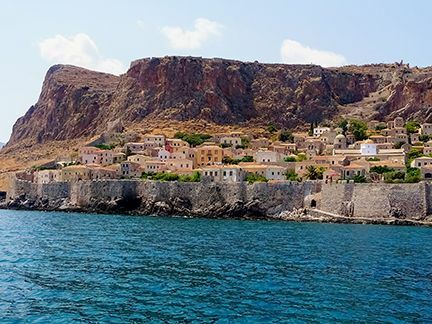 Hidden away from the rest of the world, Monemvasia is a perfect escape for explorers and history buffs looking for a town seemingly unaffected by the passage of time. 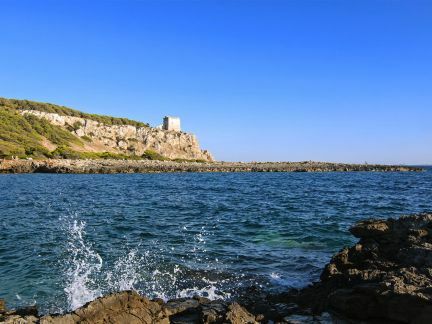 Explore Sardinia’s rugged coastline. 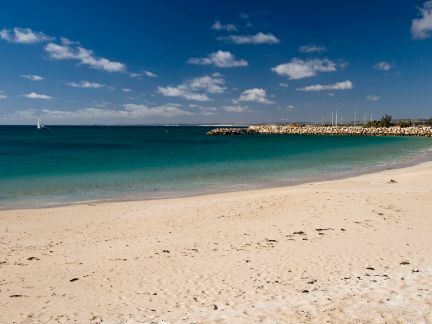 Near the iconic Basilica di San Gavino you’ll find Balai Beach—one of the most popular beaches in Porto Torres. For archaeology fans, there's Sardinia’s mysterious stone Nuraghe. 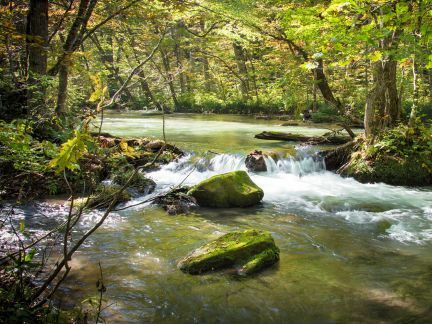 For hiking enthusiasts, follow one of the many of trails through deep gorges, lush forests, and cascading waterfalls. 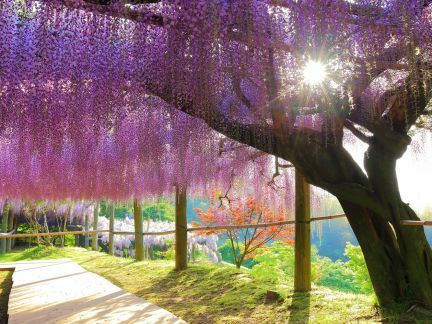 If you're looking for a dazzlingly beautiful escape, you’ve found it. 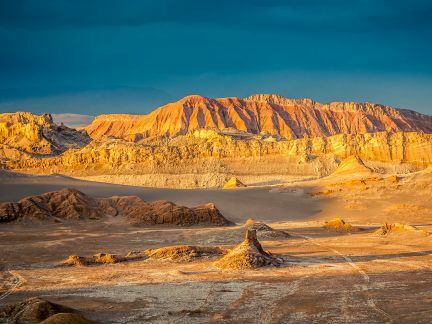 Located at a stone’s throw from the driest place on earth—the Atacama Desert—Antofagasta offers incredible natural sights, a unique industrial history, and a series of charming local venues with superb Chilean cuisine. 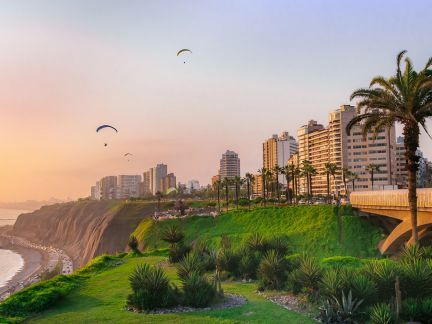 Laid-back, but with layers of history and culture to explore, “the City of Kings” is one of South America’s crown jewels. 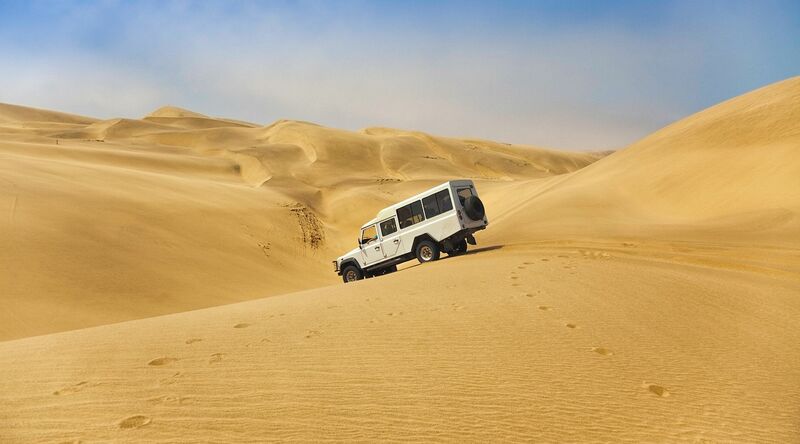 Venture outside the city to discover the famed Nazca lines etched in desert terrain. Captivating and mysterious, Pisco is a quaint fishing town with abundant marine life, a charming downtown, and intriguing archaeological and cultural significance waiting to be explored. 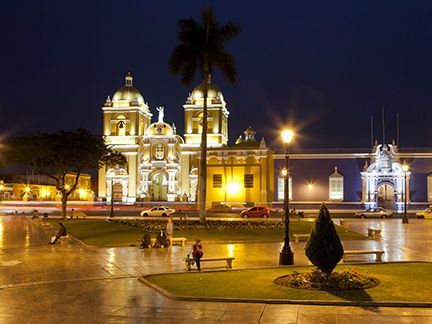 Peru’s cultural capital, Trujillo is a lively city with a storied history. Stunning colonial architecture, a vibrant arts scene, and a wealth of archaeological discoveries make Trujillo the ideal gateway to explore Peru’s pre-Incan wonders. French charm and stunning architecture meet fiery Caribbean spirit on the palm-lined streets and sandy shores of Cienfuegos. 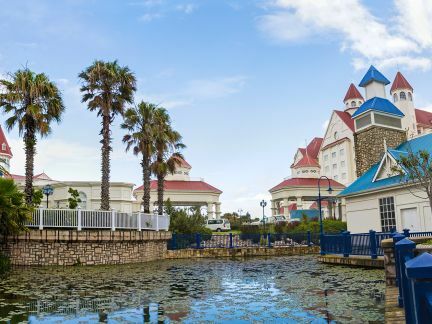 At the same time lively and laid-back, warm Caribbean breezes swirl around neoclassical, art nouveau and art deco buildings, and sweeping botanical gardens are bursting with tropical beauty. 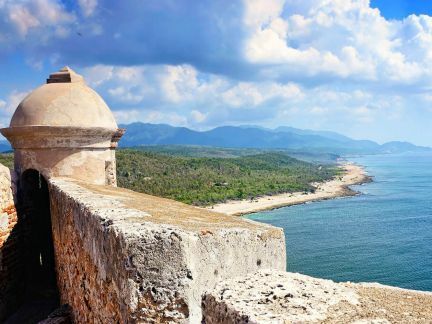 Enjoy breathtaking views from Castillo de San Pedro de la Roca del Morro, a legendary 16th-century fort known as “El Morro”, or visit Parque Nacional Alejandro de Humboldt in the Nipe-Sagua-Baracoa Mountains. 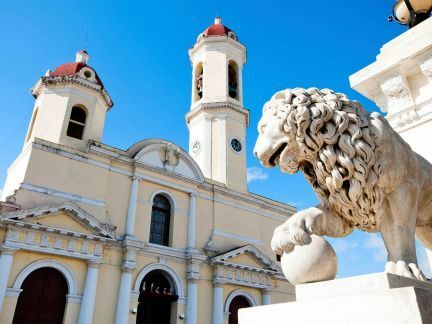 Stroll around and take it all in: the rich colonial heritage and sights like the imposing Basílica de la Caridad del Cobre. Whatever your pace, the streets definitely have a pulse of their own. Sri Lanka’s southern coast is a treasure trove of biodiversity and Hambantota is the gateway to most of it. Yala National Park holds the world’s largest concentration of leopards and elephants, while Uda Walawe National Park rivals the savannahs of Africa. The UNESCO World Heritage-protected Galle Fort is an 18th-century Dutch walled town with chic shops, grand colonial houses, and beautiful beaches. 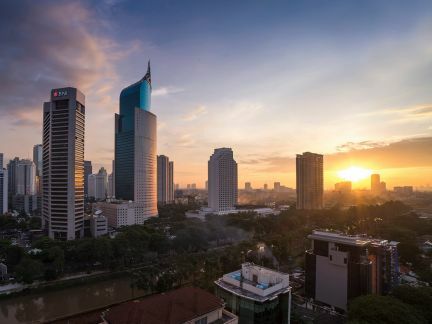 There’s much to discover in the melting pot of Jakarta. The old town of Batavia will transport you to Indonesia’s Dutch colonial past, Istiqlal Mosque is fascinating, and the flea market on Jalan Surabaya Street is a shopper’s paradise. Head to the trendy Menteng district for modern Indonesian fare, or wander the hip hub of Jalan Benda for French art deco pieces and a great cup of Java. 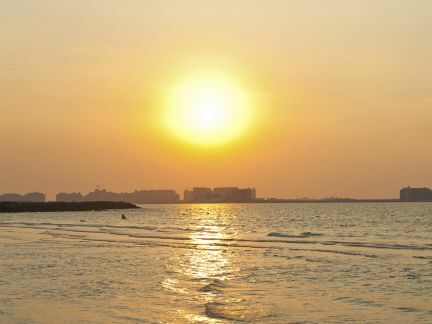 Meaning “Creek of Two Jaws,” Khor Al Fakkan sits on its namesake bay on the eastern coast of the UAE. It’s an excellent jumping off point for adventures in the nearby Hajar Mountains. Other popular outdoor sights include Al Wurrayah Falls, Jayi Mountain, and Wadi Wurayah National Park. Back in Khor Al Fakkan proper, the main attraction is the white-sand beach and coral reefs teeming with wildlife. You can drive a racecar around the F1 Grand Prix track. Surf the largest sheet wave in the world. Play golf on one of Golf Magazine’s “Top 10 New International Golf Courses.” Have a cocktail in the Yas Viceroy; a five star hotel built half on land, half over water. Go shopping at the 280,000 sq.m. Yas Mall with Rogo’s Rollercoaster Restaurant. Wee! Cultures come together in Surabaya. Beautiful Buddhist temples and Mosques, including the historic Masjid Ample, are visible throughout the city. The Arab quarter is home to narrow lanes filled with stalls selling keepsakes for your journey. Elsewhere, visit the House of Sampoerna, a unique clove museum where you can also sample delicious authentic Indonesian cuisine. 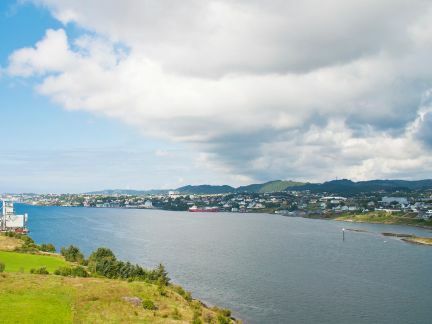 This 1,000-year-old city boasts a Viking past, which will appeal to history buffs, but also offers loads of modern day culture for a pleasing marriage of past and present. The city’s redeveloped waterfront is a lovely place to catch your breath and take in the views of the city. Live it up in the land of the midnight sun. 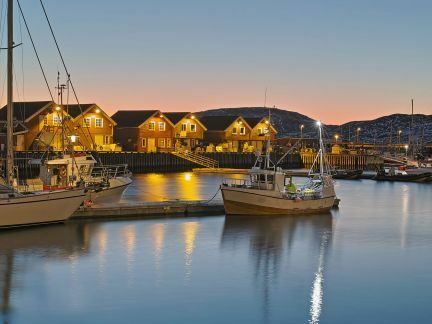 Bodø offers a breathtaking escape to a world of natural wonder just north of the Arctic Circle. Rich in natural beauty but with a fun mix of urban activity, there's plenty of adventure to be had, no matter your travel style. Head out of the city to Kerringjoy and experience life at the edge of the Earth. Why let London have all the fun? 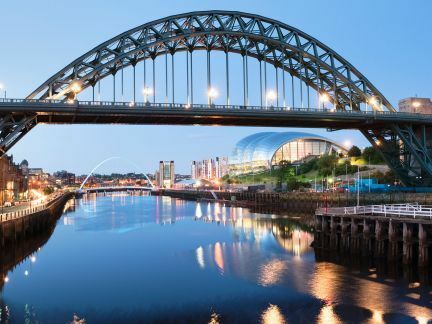 Visit Newcastle upon Tyne, one of the UK’s top up-and-coming hotspots. Ancient architecture, world-class dining, a rich arts and culture scene, you name it, Newcastle has got it. Browse nearly a dozen galleries and museums or take in a game of Footie. After, grab a bite to eat at one of the city’s elite restaurants and hit the town to take in renowned nightlife. 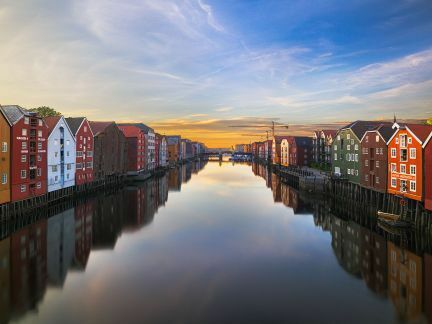 Over 1,000 years of history awaits you in Trondheim. Lining the vibrant streets of this city are 17th-century working-class homes transformed into charming bistros, cafes, and local shops. Walk or bike to Nidaros Cathedral and climb the tower for a stunning view of the city and the Nidelva river. After, tour the beautiful Ringve Botanical Gardens that overlook the Trondheim fjord. 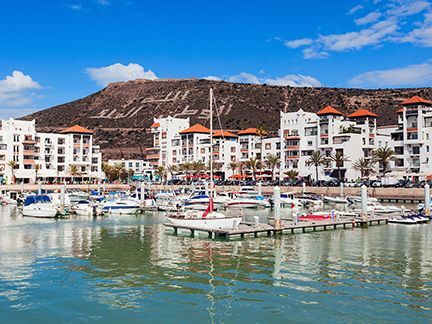 With its breathtaking beaches, clean modern aesthetic, and traditional Berber history, Agadir is unlike any seaside resort destination you’ve ever encountered. 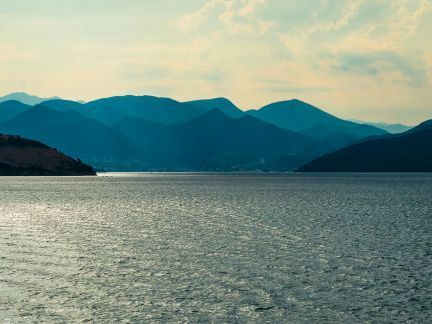 Surrounded by pine-topped hills, beautiful beaches, and crystal blue waters, Igoumenitsa is also a lively city with many shops, cafes, and restaurants. Stroll the sandy stretches of Drepanos and Makrygiali. Explore the sycamore-lined seaside road and park. Get in touch with the ancient past at the castle of Doliani, located near the settlement of Geroplatanos, which dates back to the Classical period. Pula may be a relatively undiscovered gem by most modern-day travelers, but with its protected harbor and strategic location on the southern tip of Croatia’s Istrian Peninsula, it’s proven a popular hit with invaders. 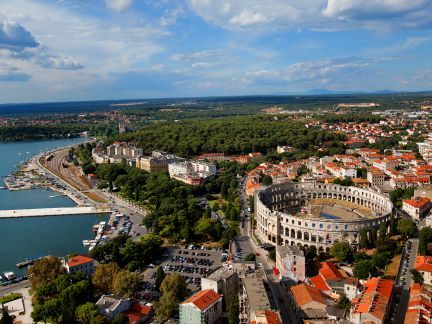 For almost 3,000 years, Pula has been home to everyone from the Romans, Ostrogoths, and Venetians to medieval knights and the Austro-Hungarian empire. 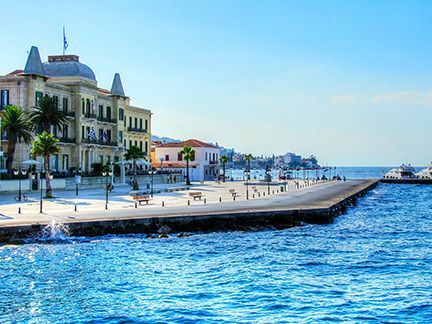 Rolling hills blanketed by pine forests, sheltered coves with sandy beaches, and crystal clear waters await you in Spetses. Exotic flavors, electric nightlife, and exciting eco-adventure. Boracay Island offers something for everyone along its white sandy beaches— you just need to know where to look. Bulabog Beach is one of Asia's most popular kitesurfing destinations, and Mount Luho offers amazing ocean views. Head to White Beach to hang out with fun-loving locals and sample delicious Filipino barbeque. Somewhere between island hopping and fantastic aquatic adventure, you’ll find stunning white sand, relaxing hot springs, and palm fringed turquoise lagoons. Explore inland via motorcycle to meet friendly locals. 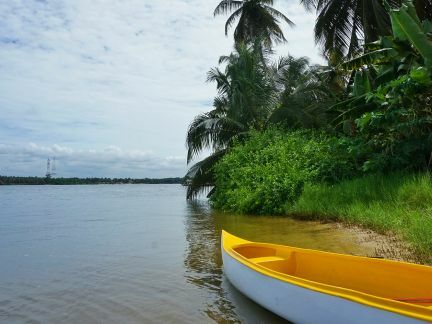 Take a tour by kayak to experience dense mangrove forests and untouched coastline. History buffs should explore below the waves to discover coral-covered Japanese war vessels. 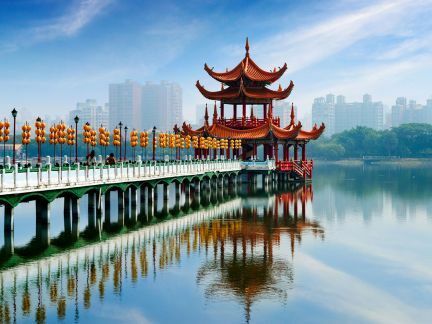 One of Taiwan’s top destinations, Kaohsiung’s must-see attractions are easily reachable by foot or ferry. Explore historic areas of the city along Love River and stop for a coffee at an airy outdoor café. Be rewarded after a hike up Monkey Mountain with sweeping views of the city below, the ocean beyond, and a refreshing drink of tea. Or sample Taiwanese delicacies at a lively night market. 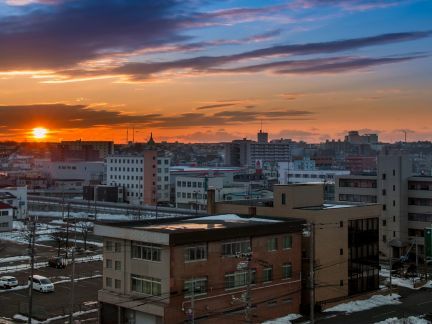 Located on eastern Hokkaido, Kushiro is an historic port with a strong fishing industry. 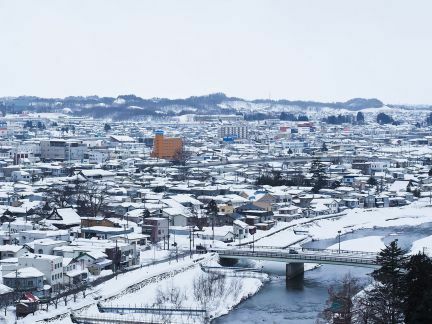 “The City of Mist” has a compelling history that reaches back to the legacy of its indigenous people, the Ainu. 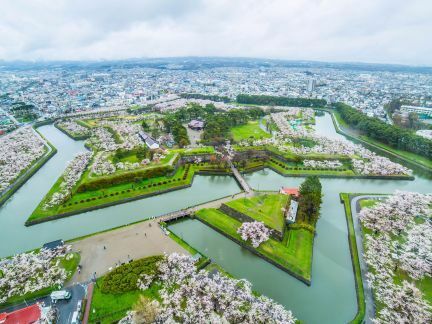 It’s also widely known for its stunning natural scenery—particularly Akan National Park and Lake Mashu—wildlife, hiking, bird watching, and fresh seafood like Hokkaido crabs, salmon, and octopus. 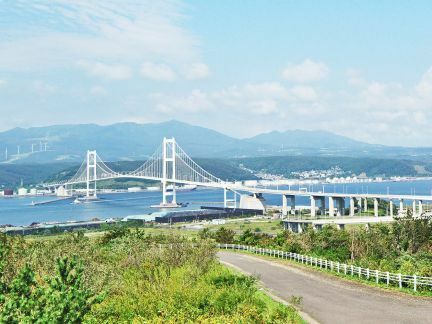 A unique ocean climate and a bustling port await visitors to the town at the “bottom of a little slope.” Muroran is home to impressive architecture, natural beauty, and restaurants every foodie will love. If you’re looking for dishes unique to the region, be sure to try curry ramen—a local favourite! 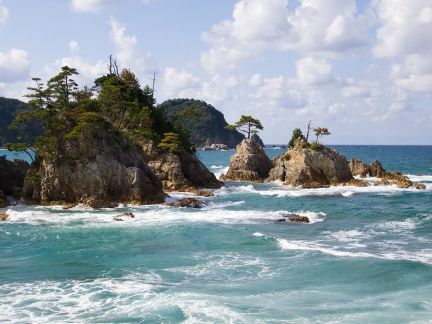 After, head to the Cape Chikyu observatory for breathtaking views of the 8-mile coastline. 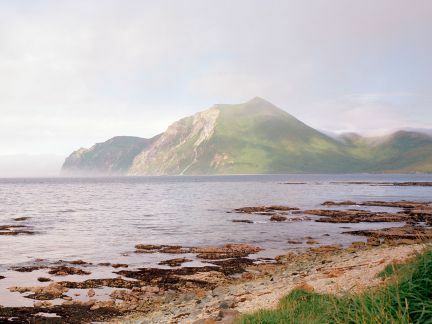 Nestled amongst a string of five volcanoes on the shores of Avacha Bay, Petropavlovsk is the ideal destination to get away from it all while immersing yourself in natural surroundings. 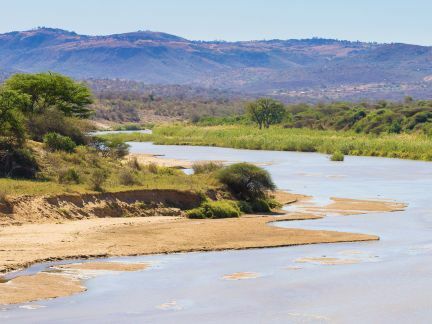 The environment lends itself to some breathtaking and unique outdoor activities including climbing volcanoes, relaxing in natural hot springs and fishing in wild rivers. For gorgeous views of the bay across the peninsula to Kasih Beach, venture to Kota Ata, where you’ll also find colonial buildings, a vestige to its former Dutch residents. The real appeal is the atmosphere of Sabang and its people. Some locals say the island’s name comes from the phrase santai banget, meaning very relaxed. 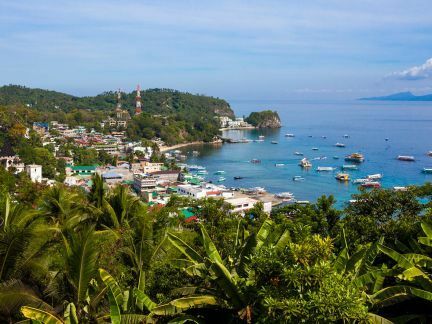 Whether it’s true or not, after your visit to Sabang, you’re sure to agree. 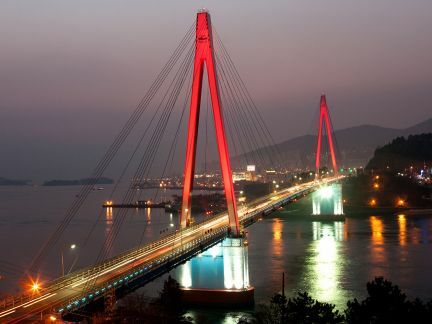 A hidden world-class vacation destination, Yeosu blends big city excitement with laid back island living. Mixing unique districts with stunning ancient architecture and natural beauty, adventurers spending time here will love the cliff side temples, the working lighthouse, and the Maritime Cable Car. Don’t miss an opportunity to stroll the many neighbourhoods to try the authentic Korean cuisine. Dutch Harbor is one of the world’s largest and most renowned fishing ports, as documented in the television series Deadliest Catch, which is filmed here. Make sure to bring your camera to capture its variety of marine mammals—such as humpbacks, porpoises, and sea lions, that can be viewed in the bay across from the Grand Aleutian Hotel. Stop by the Church of Holy Ascension, a 19th century Russian Orthodox cathedral, discover indigenous cultures, and keep an eye out for local wildlife, including over 100 species of birds. Hiking, biking, and kayaking are just a few ways you can explore the rugged mountain vistas and seascapes of this glacial paradise. 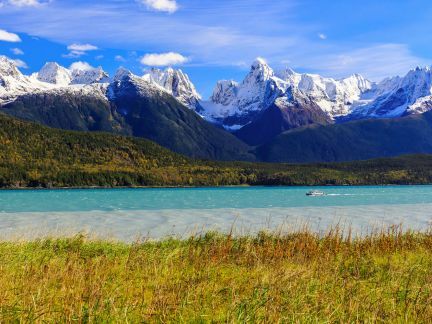 Haines is also a birder’s paradise, with nearly 400 bald eagles and 260 different species. 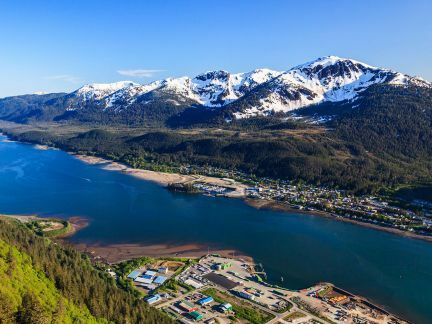 Be sure to visit Fort William H. Seward Base, the first permanent post in Alaska, and local watering holes like the Port Chilkoot Distillery and Haines Brewing Company. With a mild temperature that makes it a favorite tourist destination, Homer has many other charms. Stroll down the peony-lined Pioneer Avenue for upscale restaurants, cafes, art galleries, and even a local brewery and winery. 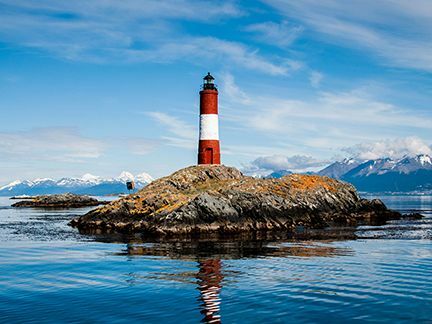 Head to Kachemak Bay for whale watching, Kachemak Bay State Wilderness Park for kayaking and hiking, and Homer Spit for beachcombing, biking, birding, and fishing charters. 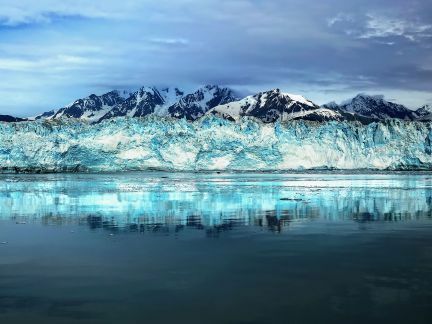 Named after National Geographic’s first society president, Gardiner Hubbard, this frosty-blue glacier is a sight unlike anything you’ve ever seen. The longest ice river in North America, this 76-mile stretch of glacier water meanders its way through Alaska to the Russell Fjord Wilderness. Witness this awe-inspiring phenomenon from onboard, while keeping an eye out for whales, harbor seals, and otters. Icy Strait Point is built on the site of a salmon cannery. The restored outbuildings now house a variety of restaurants, a museum, and local arts and crafts shops. The port is a cultural hub for the original inhabitants of the area—the Huna people. 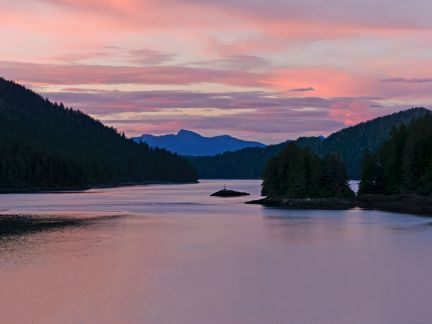 Enjoy an array of activities indigenous to the area including native dance performances, brown bear viewings, whale watching, fishing, birding, and hiking. Stretching from the Juneau Icefield to the waterfront downtown, Juneau is a treasure trove of sights. 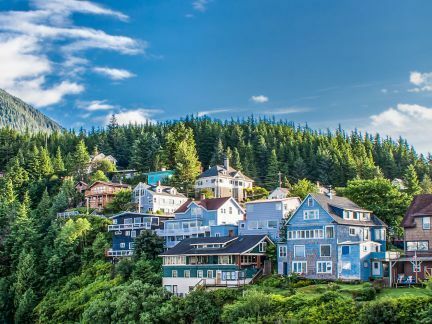 Dig into the city’s gold mining history at Juneau Douglas City Museum, stroll down Historic South Franklin Street, go whale or iceberg watching, tour Mendenhall Glacier and the Tongass National Forest, or board the Mount Roberts Tramway for great dining, shopping, and easy access to hiking trails. Surrounded by lakes, rivers, and streams, the “Salmon Capital of the World” is an angler’s paradise. Hop on a charter and keep an eye out for Ketchikan’s other marine residents like orca and humpback whales, seals, and porpoises. 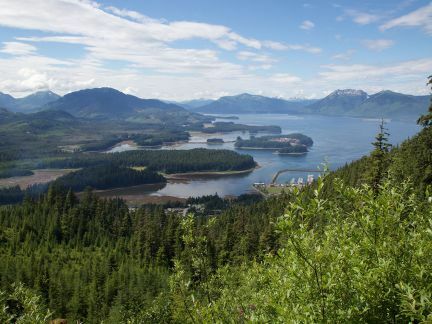 Hike Married Man’s Trail, kayak the Misty Fjords, visit the Totem Heritage Center, and stroll Creek Street for quaint restaurants, bars, gift shops, and scenic views. 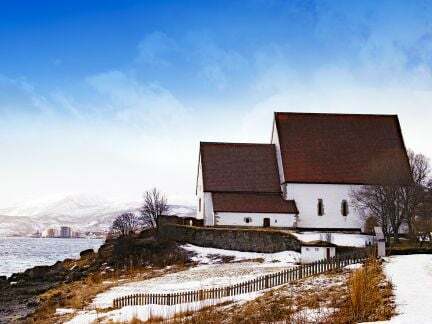 One of the top fishing ports in the U.S. for salmon, halibut, and crab, Kodiak is also a history buff’s dream—from the blue cupolas of the Holy Resurrection Orthodox Cathedral and Fort Abercrombie State Historical Park to the Alutiiq Museum and Archeological Repository. Outdoor enthusiasts will love watching whales, birds, and bears, or exploring Kodiak by Jeep, ATV, or mountain bike. 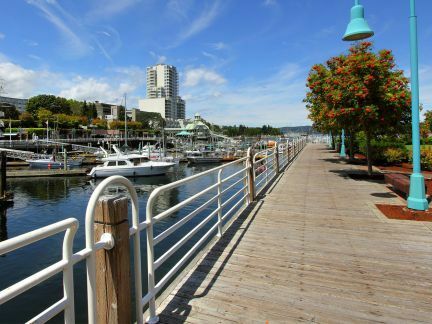 Nanaimo is a growing city with a vibrant downtown and pristine harbourfront. Teeming with museums, galleries, restaurants, and shopping, you won’t want to miss Nanaimo’s daily cannon firing ceremony, or opportunities to take in natural wonders like the Abyss and the Ammonite Falls. Elsewhere, follow the Nanaimo Bar Trail to try different takes on the city’s delicious namesake, the Nanaimo bar! Seattle may be the birthplace of Starbucks, but espresso machines are buzzing at coffeehouses on every corner. Venture beyond the city to breathtaking Snoqualmie Falls for a hike and a picnic and the powerful sight of the 268 foot crashing waterfall, one of the most stunning in the country. 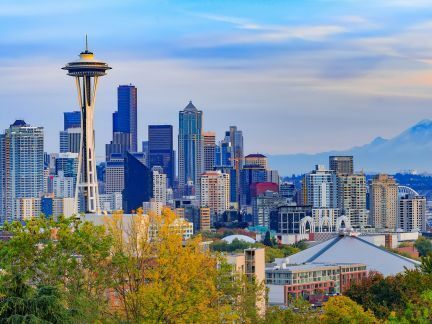 An exciting city in beautiful natural surroundings, Seattle is an alluring destination. Rain or shine. 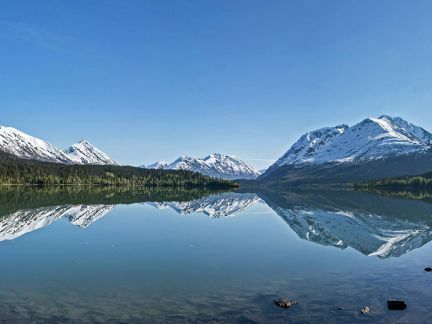 Travel to the Kenai Fjords National Park to hike or ski amongst its beautiful mountains. Kayak the tide pools along the fjords, and explore the Exit Glacier while mushing your own dog sledding team. Tour the rich waters of Resurrection Bay, join local anglers to fish for Coho salmon and halibut. 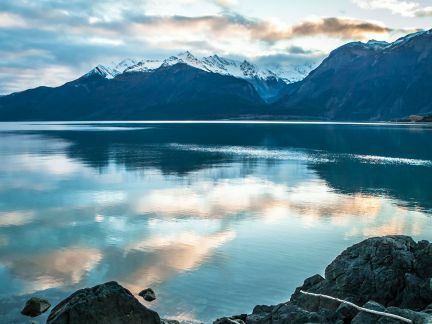 Shaped by time, earthquakes, and ocean storms, Seward’s unfolding beauty is yours to explore. A walk around the city’s downtown brings you closer to its history with views of the Blockhouse, Russian Bishop’s House, St. Michael’s Russian Orthodox Cathedral, and the storied Castle Hill. 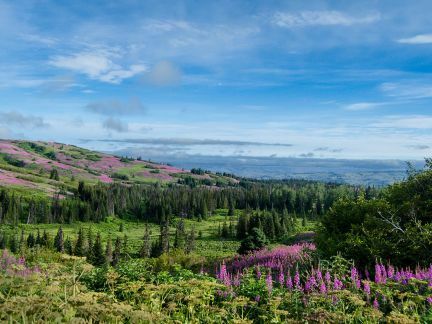 Visit the Fortress of the Bear and the Alaska Raptor Center to get an up-close look at orphaned brown bear cubs, injured bald eagles, and other birds, and learn about both centers’ commitment to serving Alaska’s wildlife. 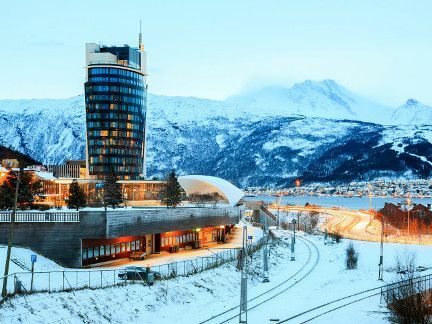 Take in historic sites like the storied Red Onion Saloon, the yellow-domed Golden North Hotel, and the decidedly rustic Arctic Brotherhood Hall. For a more detailed account, head to the Corrington Museum of Alaska History and the Skagway Museum to see every aspect of local history from mastodon fossils and native handwoven baskets to the pistol of Skagway’s official bad boy, Soapy Smith. The only thing rising higher than the Vancouver skyline is its snow-capped mountains. 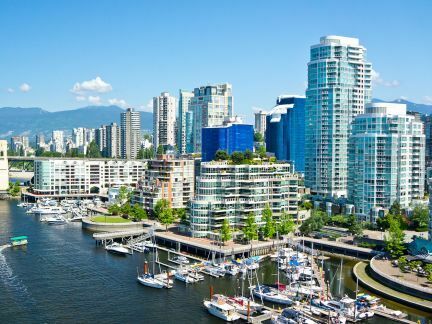 In Vancouver, you can experience summer and winter on the same day! Start with a morning on the slopes at one of the nearby ski hills, then hit the beach for an afternoon relaxing by the water. After, try some delicious meals from all around the world and discover why Vancouver is the culinary capital of Canada. 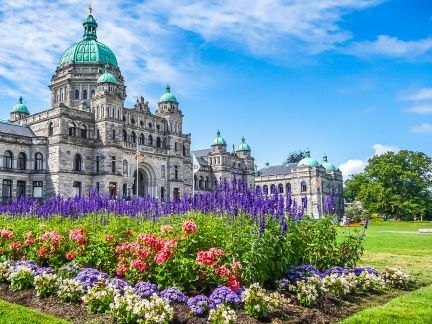 Natural oceanside beauty, stunning English architecture, and international flavors abound in Victoria. Take a whale watching tour on the Salish Sea to get up close with breathtaking orcas, humpbacks, and more. History buffs must visit the Royal BC Museum to discover Victoria’s colonial past and see the amazing wooly mammoth exhibit. After, stroll Canada’s oldest Chinatown for a delicious meal. Perched on the East Coast of New Zealand’s North Island, Gisborne is a place of rich history, beautiful beaches, and legendary wines. It’s also a city of firsts. 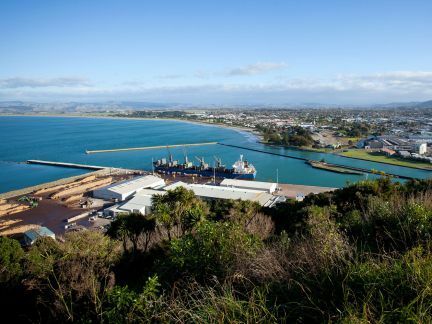 It’s where the first Māori migratory canoes landed, where British explorer Captain James Cook first came in 1769, and, since it’s also the most easterly point in the world, it is the first city in the world to see the sun rise each day. 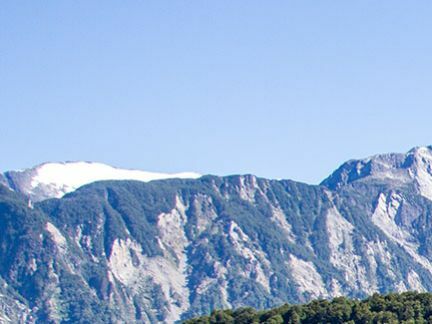 A haven for artists and outdoor enthusiasts, Nelson is a sunny, stunning, and sophisticated city in the centre of New Zealand. Marked by beautiful beaches, national parks, wineries, and other charms, Nelson is also home to buzz-worthy local music and arts scenes. Take in a show, shop for one-of-a-kind art, and then escape to the Brook Waimarama Sanctuary, a wildlife sanctuary near the city centre. 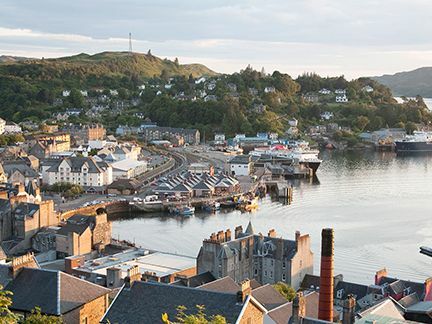 Oban is a pleasant fishing town that packs a lot into a small place. 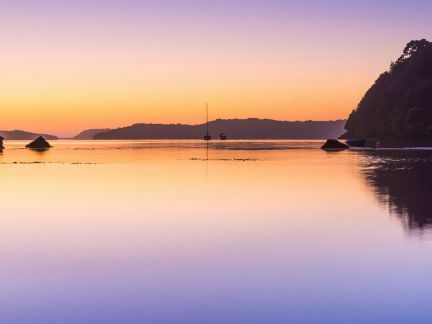 Enjoy outdoor adventures along the Great Walk, discover Māori and nautical history, and spend some time in a friendly pub. 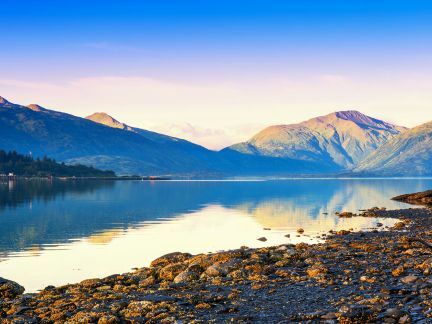 Oban is the perfect place for bird lovers and anyone who wants to spot the elusive kiwi. And as the day winds down, you’ll experience an amazing sunset, and maybe the aurora australis (the southern lights). Voted the happiest place in Britain, it’s hard to disagree when exploring Aberdeen’s abundant shops, castles, and pub-lined medieval streets. 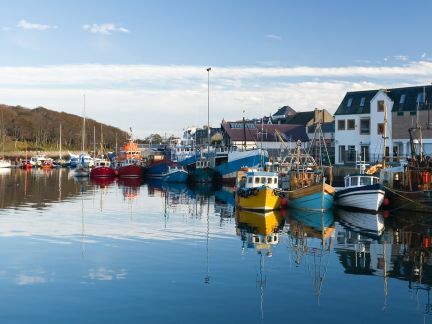 A regional hub for the North Sea oil industry, discover this modern city with an old soul. 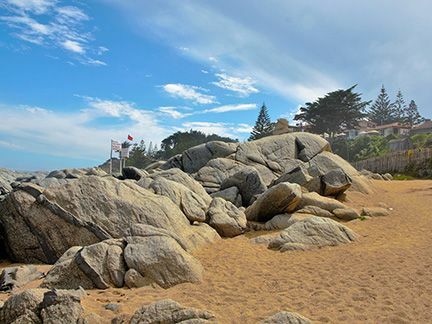 Urban life and natural splendor intersect in the Granite City's stunning green spaces, lush Victorian gardens, ornate architecture, and sandy beaches. Tucked deep in the majestic Altafjord, this city above the Arctic Circle shines in the light of the midnight sun. The local Sami people are warm and welcoming, and outdoor adventure abounds. Visit a cathedral inspired by the enchanting Northern Lights, play archaeologist and discover ancient rock carvings, and explore Europe’s equivalent to the Grand Canyon. 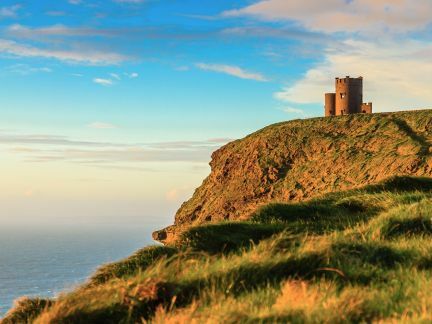 Authentically Irish, Donegal is a jewel in the crown of the Emerald Isle. 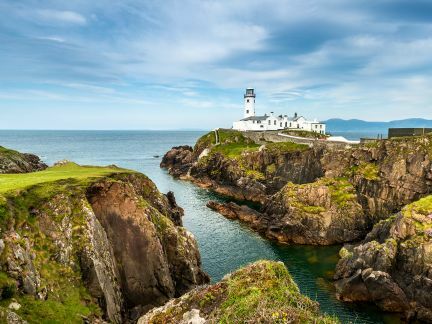 With the iconic Blue Stack Mountains in the distance, Donegal’s rugged coastline gives way to welcoming seaside pubs, while its charming city center (known as The Diamond) blends quaint modern shops with 15th century castles, abbeys, and monuments paying tribute to the storied past of the region. Halfway down the majestic River Shannon. Foynes is a port with its fair share of aviation and culinary history. It was the first place in Europe to welcome transatlantic flights of innovative seaplanes, and it’s the birthplace if Irish Coffee. Watch the world drop off at the nearby Cliffs of Moher, find a peaceful escape in Adare, Ireland’s proclaimed prettiest town, or live it up in Limerick (rhyming optional). 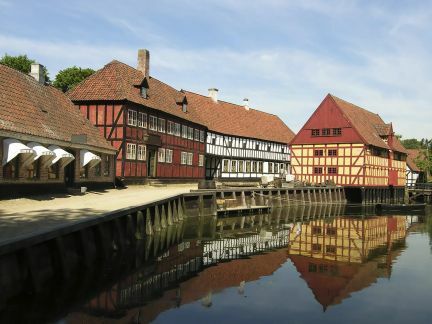 Embrace Danish comfort from the quaint seaside port of Fredericia. Quintessentially Scandinavian, small-town charm abounds in this city flanked by emerald green fjords. 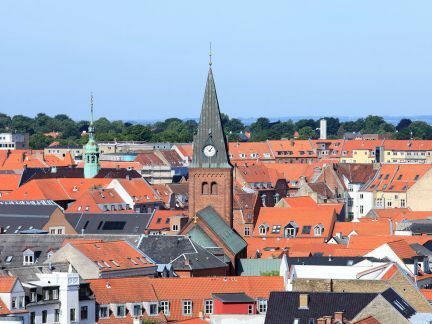 From coffee sipping inside the city's fortress walls to exploring the boardwalk by bike, let Fredericia help you discover why the Danish are among the happiest people in the world. Dating back to 1124, Galway has a storied history, surviving everything from Norman invaders and Cromwellian conquests to the Irish Potato Famines of 1845-1852. 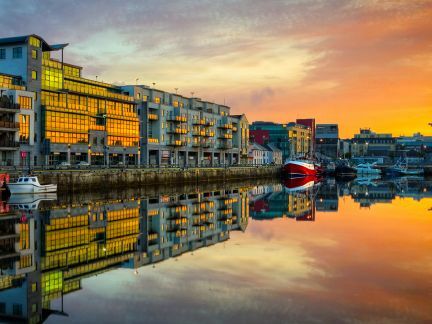 Nowadays, Galway is considered one of Ireland’s most enchanting cities, with brightly colored shops, excellent bars and restaurants, traditional Irish music sessions, and an average of 122 festivals and events each year. 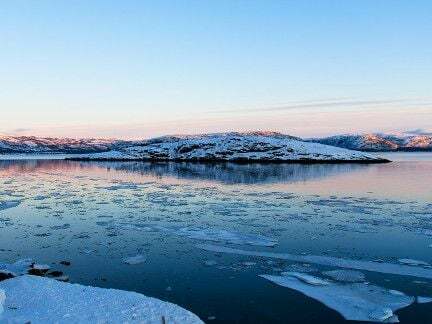 Located on Norway’s largest coastal island of Hinnøya, balmy, subpolar oceanic temperatures and the breathtaking Scandinavian Mountains invite you to explore Harstad. Hike Sætertinden mountain. Fish in the icy Atlantic waters. Dive deeper into Nordic spa culture. Or, simply take a bike ride to experience native Norwegian life in the busy city streets. 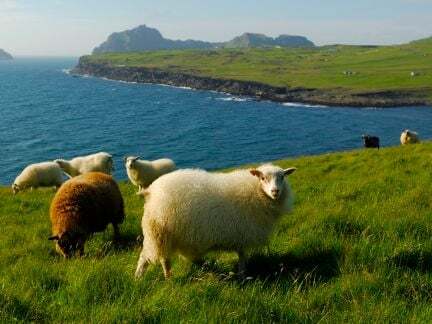 Despite being just off the shore of mainland Iceland, the largest of the 18 Westman Islands feels many oceans away. 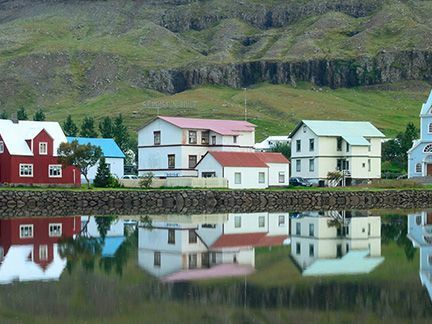 Born from volcanoes and forever at their mercy, Heimaey is a small fishing village with a history as rocky as it is intriguing. Discover incredible hiking and natural beauty, world-class golf (with midnight tee times), and meet the world’s largest puffin colony. Surrounded by snow-capped mountains, this village is your gateway to the UNESCO World Heritage West Norwegian Fjords. 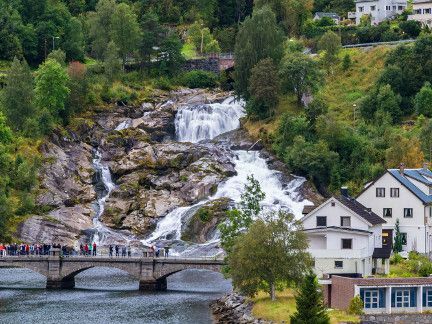 Marvel at the glacier-fed waterfall that crashes through the center of town, discover a unique museum dedicated to Peer Gynt, and set out to explore the sweeping valleys, lush landscapes, and fantastic fjords Norway is so famous for. 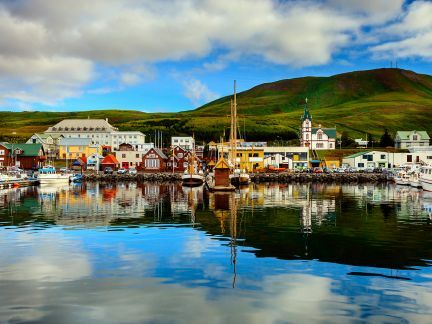 The whale-watching capital of Iceland, Husavik sits on the eastern shore of Skjálfandi Bay, where humpbacks, minke, and blue whales breach the waves and slap the water with their enormous fins. Geothermal springs south of town are the perfect spot to relax, while the Exploration Museum pays tribute to adventures mapping the globe, and beyond. 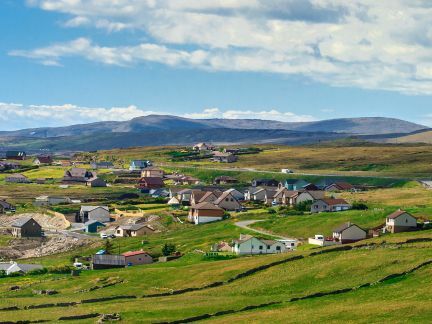 Secluded and seaswept, the Shetland Islands are home to a unique blend of Scandinavian and Scottish culture. Fiddle music floats down streets named to honor the old Norse language. 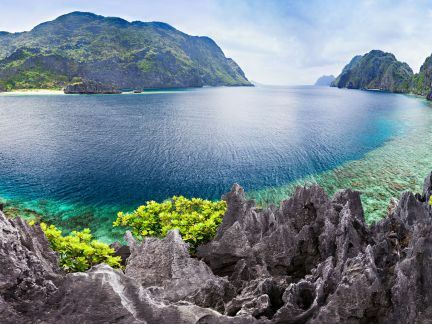 Rocky cliffs and rich farmland are yours to explore over 100 islands that embrace a slower, more authentic pace of life. Imagine a town at the edge of the world. Backed by rugged mountains, overlooking striking blue glaciers, where polar bears often pay a visit. That’s Longyearbyen, the northernmost town on Earth. 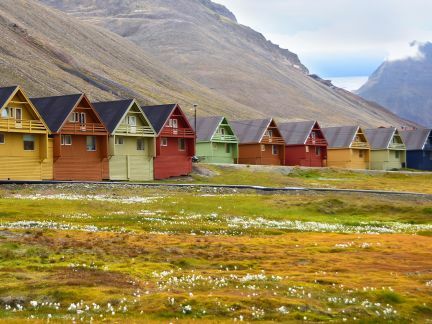 Get ready for adventures over Arctic tundra and incredible wildlife encounters, and get to know a community that thrives in the Land of the Midnight Sun. 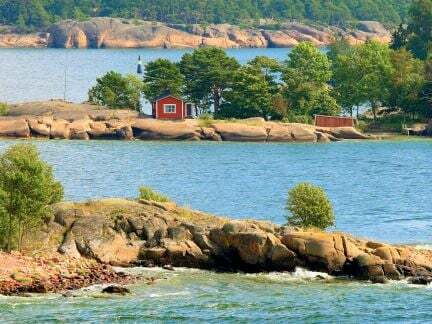 Our Finland cruises bring you to beautiful Mariehamn, the capital of Aland, a scenic archipelago of 6,500 islands. With Finland’s warmest climate and scenic, sheltered harbors, this cozy town holds a proud seafaring history. Explore one of several cultural and maritime museums, venture inland to the vast surrounding farmland and countryside, or peruse local shops and cafes for traditional Finnish crafts and cuisine. 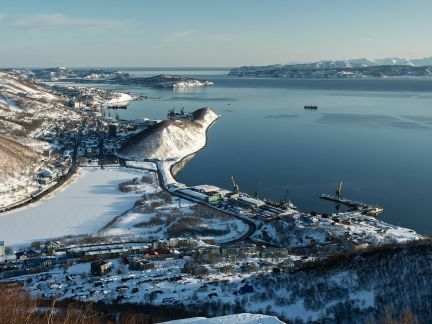 There’s nothing quite like Narvik. Surrounded by steep fjords, towering mountains, and giant glaciers, this town above the Arctic Circle shines in the midnight sun. With a warm climate and rich naval history, history buffs and outdoor enthusiasts will be on cloud nine. 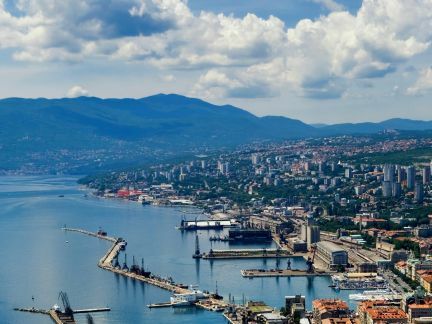 Ride the Otofen Railway as it hugs sheer fjords, visit the impactful Narvik War Museum and see Norvik from a unique perspective with a soaring gondola adventure. Remote and beautiful, Ny Ålesund is the perfect destination for explorers seeking the farthest reaches of human civilization. 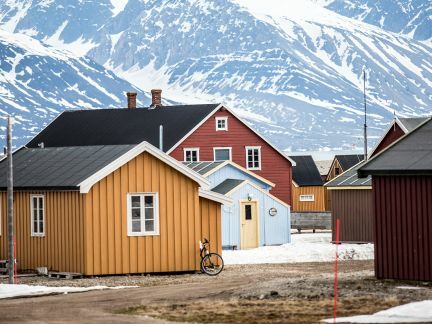 Once a mining town, Ny Ålesund is now a research community where approximately 30 people live year round. Don’t let its small size fool you, Ny Ålesund is home to absolutely stunning views you won’t find anywhere else. From Francis Drake to America’s Pilgrim forefathers, countless epic voyages have set sail from Plymouth. Discover a seafaring spirit of exploration in Britain’s Ocean City and explore a charming waterside district lined with historic Tudor buildings. 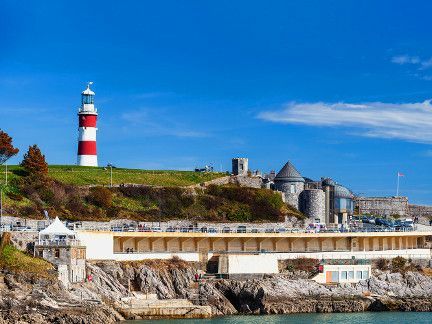 Walk the iconic Mayflower Steps, breathe in fresh salt air sweeping in from Plymouth Sound, and venture out into the quintessential English countryside. Discover “the Paris of West Africa”. One of Africa’s largest cities (and the second largest French speaking city in the world), Abidjan is a modern city with its own distinct tropical soul. Explore Further<sup>SM</sup> through ten districts that each reveal a different aspect to this vibrant former capital. From authentic open-air markets to thriving business districts, you’ll find something for every travel style in Abidjan. 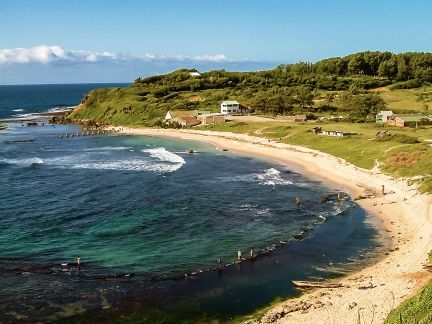 It’s referred to as Africa’s Smiling Coast. 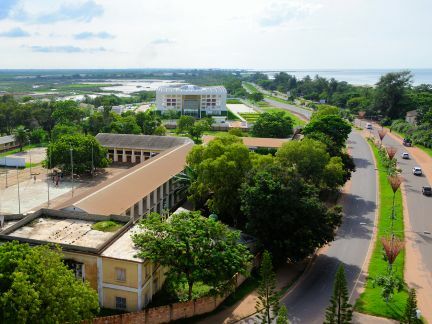 Not only because it’s home to the mouth of the Gambia River, it’s also because the locals are famously friendly and eager to share their colorful culture with visitors. Head to Albert Market for an authentic look, touch, and taste of local life, and head to a nature reserve where you’ll find the closest tropical forest to Europe. 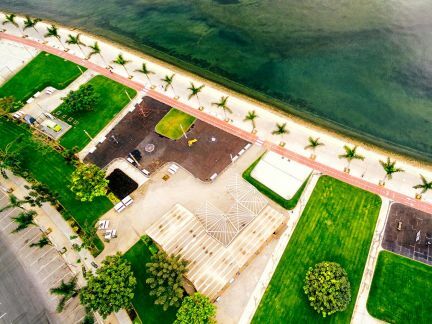 Along a half a moon-shaped bay on Africa’s rugged western shores, you’ll discover Luanda, Angola’s shining capital. Blending a colonial past with modern construction, Luanda is home to towering memorials, UNESCO World Heritage sites, meandering oceanside promenades, and ornate churches. 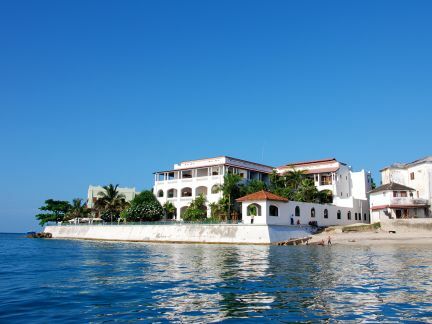 Discover a quaint fishing village with a colorful German colonial vibe and a rich history rooted in the diamond rush. 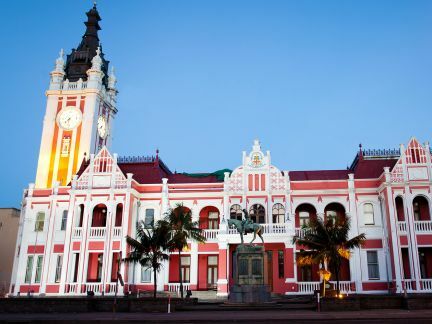 From the rugged, scenic beauty of the windswept South Atlantic shores, to the vast Namib Desert and ghost towns disappearing in the sands of time, Luderitz is a hidden gem with a quirky and fascinating history waiting to be explored. 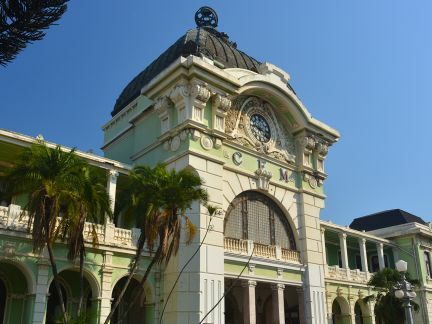 Welcome to diverse, enchanting Maputo, with Portuguese colonial-era architecture and a colorful mix of modern cultures. 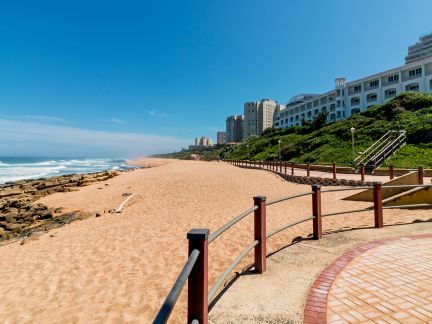 In Old Town, discover incredible parks, restaurants, markets and cafes, and stroll the along coastline for incredible panoramic vistas of the Indian Ocean and some of the area’s most beautiful beaches. Palm-fringed and surrounded by turquoise waters, Mombasa is a stunning tropical destination nestled near Africa’s wild heart. Surf meets safari in this eastern Kenyan city set on the Indian Ocean. 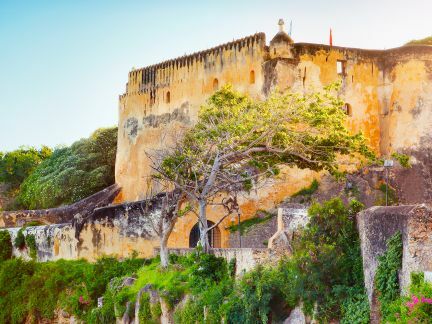 Colonial history and traditional Swahili style intermingle in the city's architecture that is both rustic and modern at the same time. Explore nature preserves, walk barefoot in warm sands, and haggle for market deals along the Haile Selassie Road. 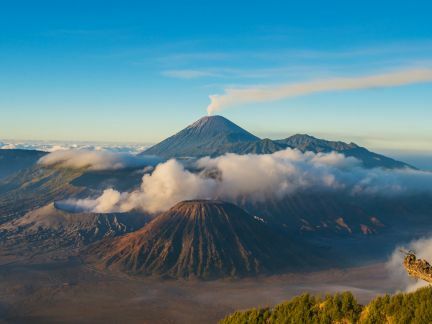 Forged in the fire of two impressive volcanoes, Réunion is located 500 miles off the coast of Madagascar. 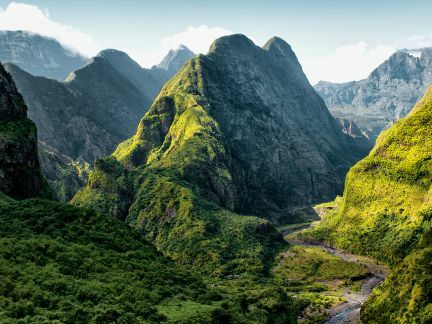 The quintessential island paradise, Réunion satisfies the curiosities of even the most well-traveled explorers with its towering peaks, lush rolling hills, and thrilling new adventures and possibilities at every turn. A turquoise gem set in the Indian Ocean, there is so much more to discover in Mauritius beyond beautiful beaches. 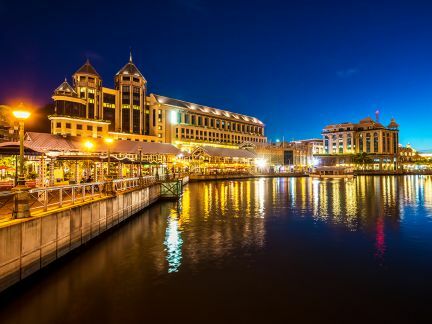 In Port Louis, the imprint of colonial power can still be seen, but it’s blended with a diverse array of cultures to create an atmosphere, that’s unique, warm, welcoming, and just the right amount of fast-paced for your cruise vacation. 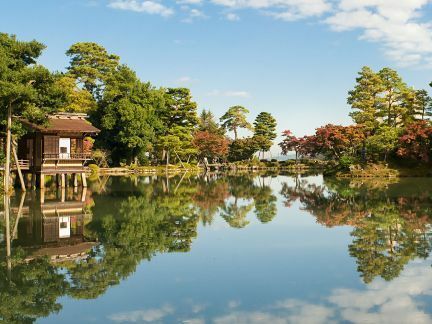 Explore electric markets, tranquil botanical gardens, a breathtaking chain of seven waterfalls. 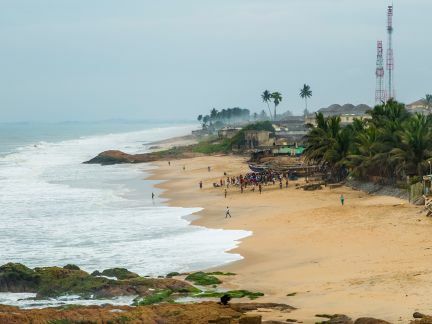 Ghana’s third-largest city, Takoradi seamlessly blends laid-back beach vibes with exciting urban energy. Market Circle is the hub of activity, and home to delicious street food. Beautiful seaside resorts are close to port, and the surrounding area offers an in-depth perspective on the region’s slave trading past. 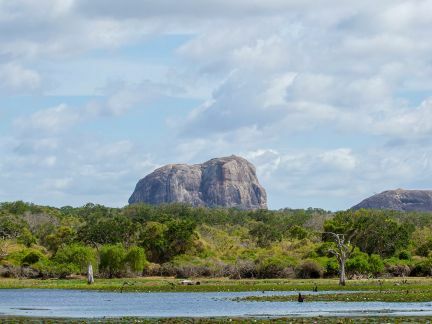 Surrounded by crescent-shaped beaches on three sides, this secluded port in the southeast is your gateway to experience unique animal and plant species found only on Madagascar. 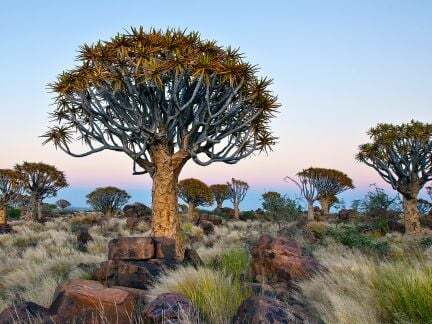 Lemurs, baobab trees and spiny forests are all just a short drive away from town. Untouched by the trappings of touristy ports, Tolagnaro really is a piece of paradise found. It may only be 26 miles off the coast of Tanzania, but the beautiful archipelago of Zanzibar feels like a world away. From its warm turquoise waters, powder white sands, and fields scented with cardamom, cinnamon, and clove, to the Arab, European, Indian, and Persian influences of the UNESCO World Heritage Site of Stone Town in Zanzibar City, it’s a veritable feast for the senses. A beacon on the shores of the Adriatic Sea, Ancona is a city steeped in over 2,400 years of history. 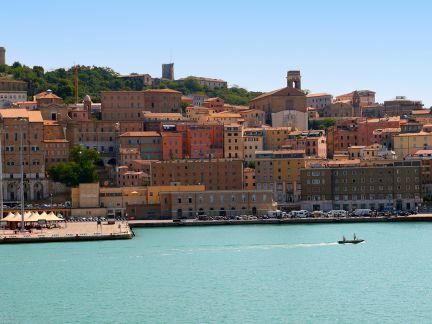 On Azamara’s cruises to Italy, walk beneath Ancona’s towering marble Arco di Traiano, tour the Ancona Cathedral—built high above Old Town atop an ancient Roman temple—and explore millenia of human history at Marche National Archaeological Museum. Mention the word “Kalamata” and visions of large, plump olives start Greek dancing around your head. But when we’re talking Kalamata, the capital city of Messenia in the Greek Isles, there are even more tasty treats to sink your teeth into. It’s a veritable buffet of beauty, with numerous historic sites, great attractions, spectacular beaches, and even better food (including olives). 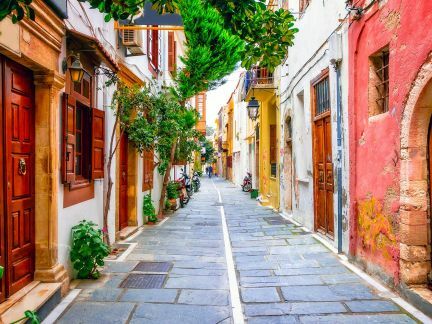 Be greeted by an enchanting Venetian harbor and get lost in a maze of narrow streets lined with rainbow-hued homes in this romantic port town between Chania and Heraklion on Crete. 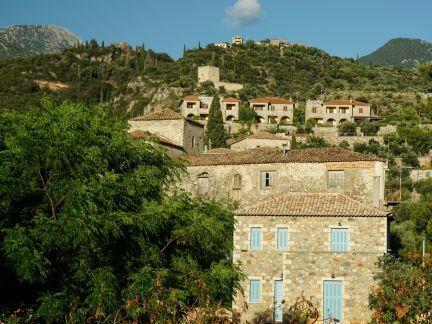 An imposing fortress is home to breathtaking panoramas, and the surrounding countryside reveals plunging gorges and villages nestled among sprawling olive groves. 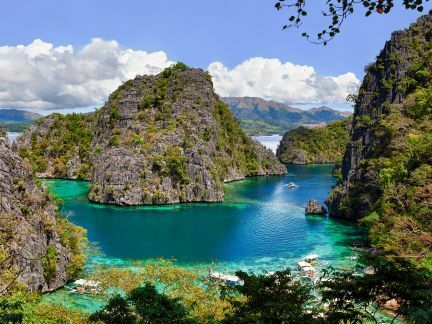 Warm, gorgeous lagoons, lush jungle canopy, and bright white sands circle two majestic mountainous peaks on this incredible island of aquatic discovery. Savor succulent seafood, shop for fine black pearls, or simply gaze in any direction for serene “pinch-me-I’m-dreaming” natural beauty. Bora Bora is unquestionably one of the most beautiful island destinations on Earth. Surrounded by breathtaking beauty, this quaint settlement tucked on the eastern side of Hawaii Island offers unlimited opportunity to relax, explore, and learn a thing or two. Explore ancient terrain where hot lava flows into the bright ocean below. Discover state-of-the-art museums. Taste the freshness of a tropical retreat in America’s own backyard. Think of Honolulu, and visions of swaying palm trees, beautiful beaches, and hula no doubt dance to mind. But that’s just a scratch on the azure surf(ace) of this cosmopolitan capital. 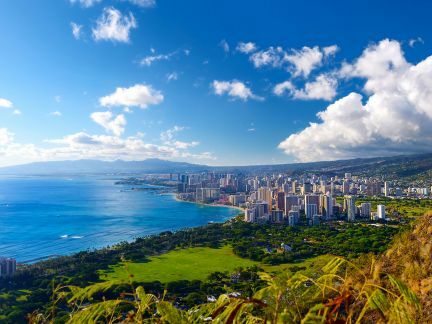 The city is also home to stunning scenery, excellent national landmarks, an eclectic food scene, and yes, incredible beaches—including world-famous Waikiki, worth a dip for the people-watching alone. 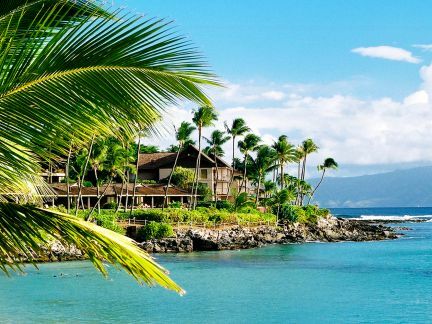 Once known as Lele (meaning relentless sun) Lahaina has grown from a sleepy whaling port to a vibrant seaside paradise. Here, great humpbacks swim among dolphins, angelfish, and seals, and mynahs sing above Front Street while locals sell art, jewelry, and island treasures. Walk in the sun, snorkel in crystal clear waters, and join an island Luau, complete with hula dancing and a pig cooked in a traditional underground oven. 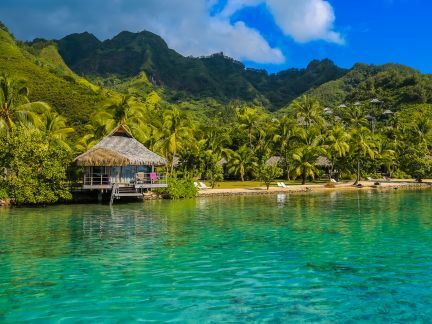 A former retreat for Tahitian royalty, Moorea is a bucket list worthy destination that's home to a traditional farming village, amazing marine life, and winding jungle roads, ideal for exploring. 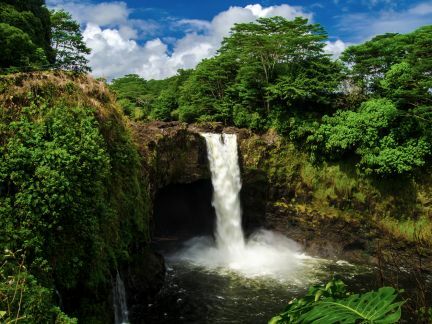 Discover one of the Island’s many waterfalls. 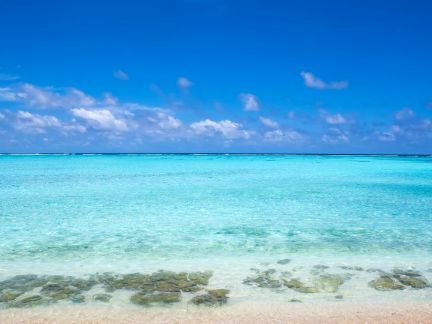 Dive into the turquoise waters to snorkel and scuba the reefs surrounding Cook’s Bay and Opunohu Bay. Tour the Island's lush interior and experience the true Polynesian culture. Removed from resort life, the island of Kauai delivers on authentic Hawaiian experiences. The pace of life is decidedly gentle and easygoing, and famously friendly locals will show you what it’s like to truly live on island time. 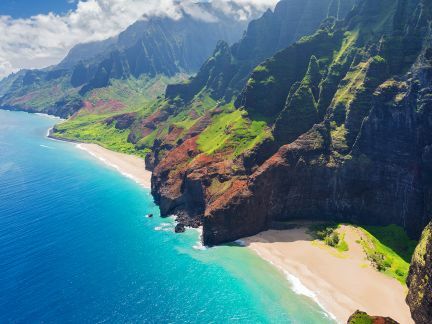 Jaw dropping natural wonders like Waimea Canyon, the Na Pali coast, and the Waialeale crater are just begging to be explored. Papeete, meaning <em>water basket,</em> was where Tahitians once traveled to fill their calabashes full of fresh water. Today, it is where visitors from all over the world travel to experience the best of Tahiti. Here, learn the history of black pearls, snorkel in blue lagoons, hike through lush tropical valleys, and take a world tour of culinary delights with the city’s iconic food caravans. 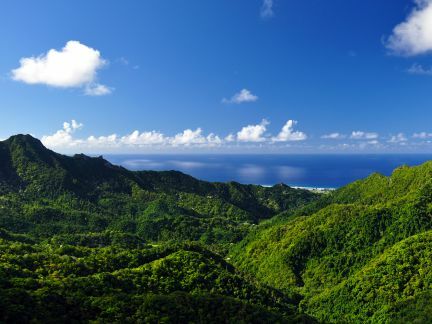 Sure, Rarotonga may be the largest of the 15 Cook Islands. But with a circumference of just 20 miles (32 kilometres)—and a population that tops out at around 11,000—it remains one of the South Pacific’s most charming, friendly, and easy-to-explore places you could ever hope to discover, with beautiful beaches, warm turquoise waters, and a bus service that runs clockwise and anti-clockwise. 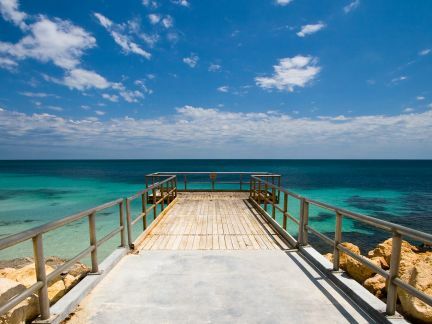 “The capital of the Margaret River region.” “The gateway to Margaret River wine country.” “The events capital of Western Australia.” Whatever you want to call it, “the coastal playground” of Busselton sure does have a lot of monikers—and even more things to do. 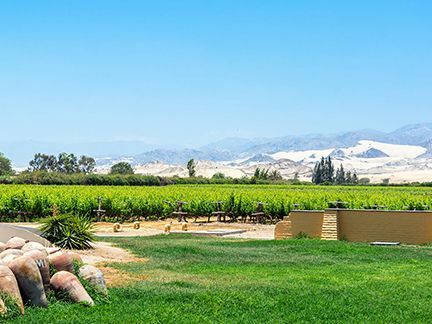 Get ready to explore a bustling waterfront, fantastic national parks, eclectic historic sites, and some of the best wineries in the world. 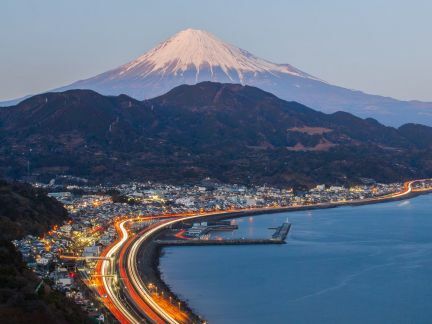 Under snow-capped Mount Taranaki unfolds the vibrant city of New Plymouth. 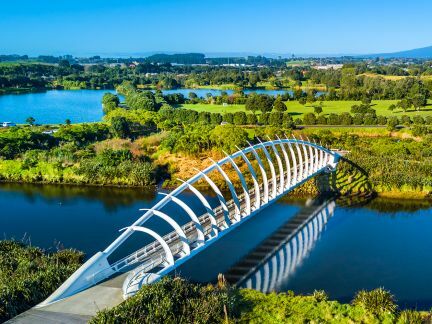 Midway between Auckland and Wellington, this active center of the Taranaki region offers plenty of opportunity for outdoor adventure from its crowning peaks to its coastal plains. 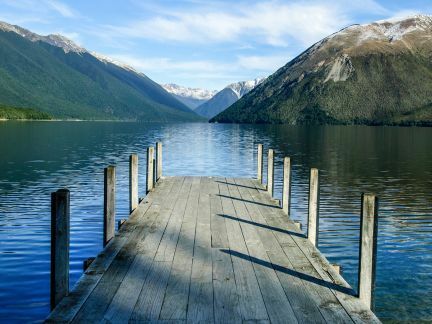 Vast and breathtaking, get a taste of the wild meets the wonderful contrast that is New Zealand.